Teachers and administrators struggle to find time to work together in a meaningful way. There are plenty of meetings scheduled. Many teachers leave these meetings though with the feeling of “could have spent my time doing more important things”. How do we squeeze in one more meeting to help teachers grow as professionals? How do we add one more opportunity for teachers to learn important new skills, listen to one more educational consultant, one more expert on a new initiative? How do we give teachers the time to learn with and from their own colleagues? How can teachers learn from what is going on in the classroom next door? I am a strong advocate for educators experiencing the type of learning they want to expose, inspire, support in their students’ learning. Building an online professional development hub/community for your school as a platform will give your faculty the opportunity to experience exactly this type of learning. An online PD Hub moves teacher learning into the “Now”, away from one-size-fits all professional development, away from Tuesday’s faculty meeting at 3 pm, away from sitting through professional development workshops that are not relevant to one’s students or subject areas. 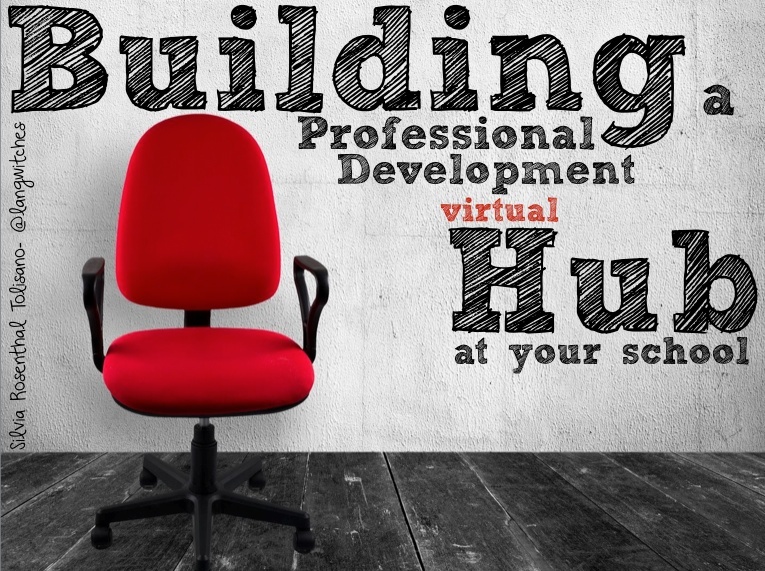 Why would you want to invest time and resources into building an online professional development hub for your school? Professional development can happen in your pajamas on a Sunday morning or (if you are a night person) at 10 pm at night. Teachers can learn in small chunks of time… 5 minutes here, 5 minutes there… without having to sit through an extended period of time at the end of a long day of work or on a scheduled workshop at 8 am on a weekend. Learning happens not only in the faculty lounge, media center, at a workshop venue or in a conference room. It can happen at home, in your car (listening to a podcast), waiting at a doctor’s office or at your children’s swim practice or dance lessons. 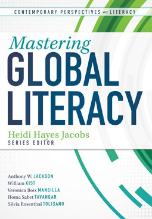 Professional development also does not only happen locally, but teachers can connect to colleagues and learning opportunities around the world. Ewan McIntosh said ” Sharing and sharing online specifically is not in addition to the work of an educator, it is THE work”. Educators are inherently people who share their knowledge. Technology enables us to share at a larger scale, beyond students who are physically in the same place at the same time. Web 2.0 tools give us the ability to create, publish and disseminate what we want to share with a world wide audience. Personal Learning Networks (PLN) are built on the fact that educators will share and contribute to the network as much as they are “taking” from it. The word “curation” was taken from the context of a museum curator, who selects, organizes, and presents artifacts to the public using his/her professional knowledge. 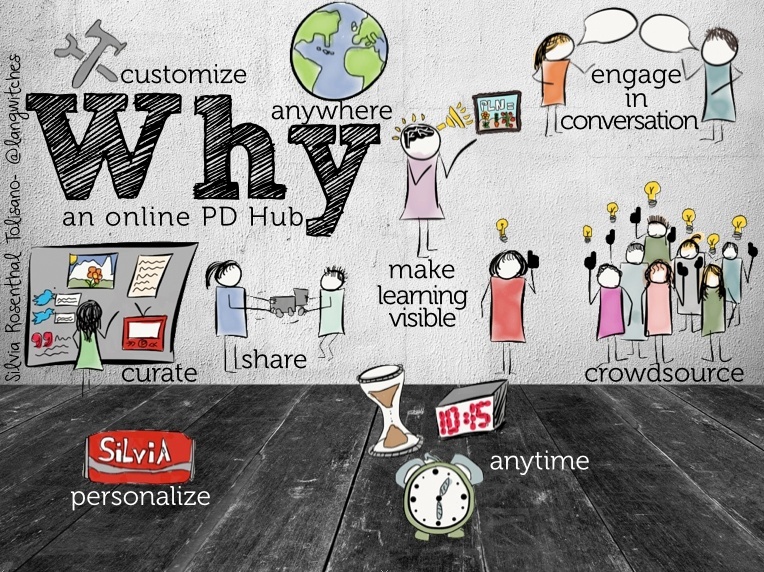 The school’s PD hub becomes the place (“museum”) for curated information, especially selected, organized and presented by professional educators for each other. Crowdsourcing is defined as obtaining information or input into a particular task or project by enlisting the services of a number of people. David Weinberger said: “The smartest person in the room is…. the room”. Harvesting the collective experience of teaching and learning in your school community is worth enlisting all members of your school. It is about taking advantage of a platform that supports and encourages contributions and collaboration through experiences, perspectives and educational data. Many teachers are completely isolated in their classrooms. There is seldom time to chat with colleagues, conversations are cut short by the bell ringing, the next meeting, car pool duty or students needing additional help after class. Meetings are taken up with administrative issues and endless paperwork to be completed. A hub, designed to foster and support conversation among administration and faculty, allows educators to engage in a conversation in their own time, their own space, their interests and at their own level. It also fosters an important modern skill of being able to ” engage colleagues through the use of technology. It’s vital that we educators explore the use of digital PLC’s and the learning that can come from the connections”. 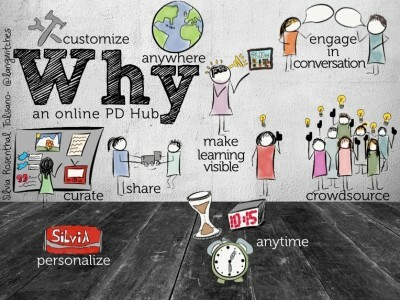 A PD hub, is a platform to house a myriad of media (text, images, slide decks, videos, audio files, etc.) that showcases and makes the learning taking place at the school visible. Teachers share student learning as well as their own learning by making it visible for others to read, view or listen to. Interesting post! I agree that it is important to invest time and resources into building an online professional development hub at my school. This article points to the fact that a professional development hub is not only engaging for educators, but it is also easily accessible to multiple audiences, which allows for a collaborative effort in providing the best education possible to the next generation. That’s our goal as teachers- to give the best education possible to our students; it’s a lot easier to do that when we come together to share the best of our ideas. If the expectation is to build a classroom where authentic learning is taking place, it’s important that educators also take a role in authentic learning themselves. Collaboration among educators is the key to enhancing student learning and promoting student achievement. Why not provide our school the platform to do so that involves the very technological tools that we are expecting our students to use? 21st century learning should not just be limited to our students. We, as educators, should take an active role in applying 21st century skills as a way to encourage our own professional development, collaborate with others, and expand our learning network. Being on line is being on YOUR time. You can be in coffee shop on a Sunday morning networking with other teachers utilizing a Professional Development Hub. Everyone has such a busy schedule, and this is a great way to communicate! I would love to be in a place to brainstorm, solve problems, be active and participate in collaboration while being on the beach and enjoying the scenery. I can actually have a book talk and ask quick questions to get feedback from other Professionals. I actually saw a Hub on Twitter and follow it. I haven’t responded yet, but I do plan to! I learn so much from what others say and can’t wait to actually be part of one. At a PD Hub, I can pick and choose what is applicable to me. Take the info that is relevant in my classroom. So basically it’s important to invest time in it so that I can share resources, document, search, be open for feedback, and it’s an aid in the process of writing and reflecting. So, these are the reasons why I would want to invest time and resources into building an online professional development hub for my school. 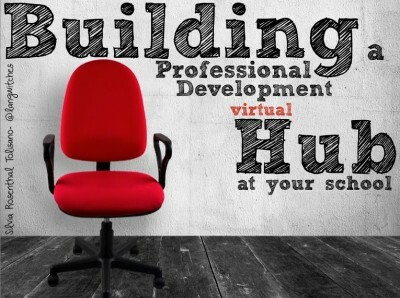 I think that an online professional development hub is a great idea! Having information that can help us as educators at our finger tips is always a plus, and having another avenue to receive the information is also great. Another reason why this is such a great idea is that it opens up the opportunity for so many more of us to share our knowledge and opinions, and it also doesn’t limit our communication to meetings where some of us might not feel comfortable sharing. 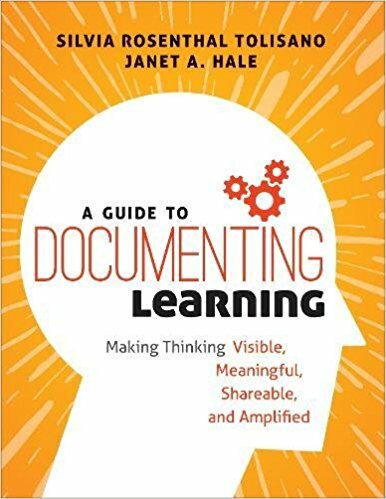 This is a useful tool for collaboration, and opens the doors for everyone to collaborate and share ideas across grade levels.